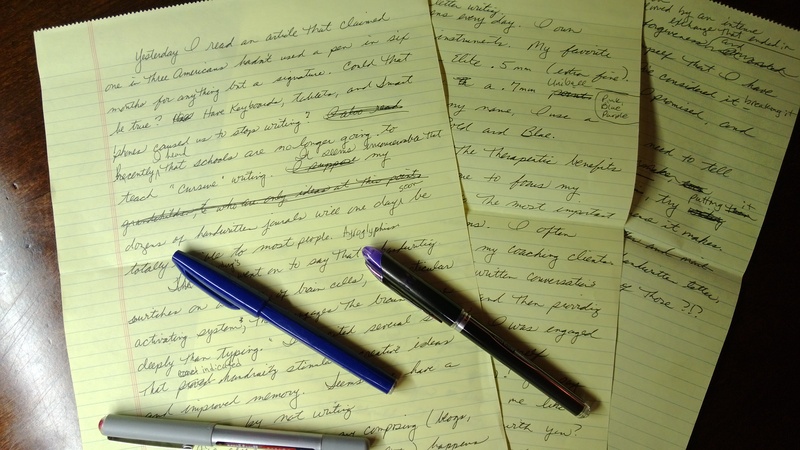 This blog was composed the old-fashioned way … handwritten on a legal pad. Yesterday I read an article that claimed one in three Americans hadn’t used a pen in six months for anything but a signature. Could that be true? Have keyboards, tablets, and smart phones caused us to stop writing? Could be. I heard recently that schools are seriously considering no longer teaching “cursive” writing. It seems inconceivable that my multitude of handwritten journals will one day be totally illegible to most people. Like hieroglyphs. The article went on to say that “handwriting switches on a cluster of brain cells, the reticular activating system, that engages the brain more deeply than typing.” It cited several studies that found handwriting stimulated creative ideas and improved memory. Seems we have a lot to lose by not writing. I’ll admit, most of my composition (blogs, correspondence, emails, and even to-do lists) happens at the keyboard. Texting has replaced written notes. Facebook and emails have replaced letter writing. Nonetheless, I use my pens every single day. I own over a hundred writing instruments. My favorite for journaling is the Uniball Vision Elite (.5 mm, extra fine, blue, black, red, green, or purple). In the office, I prefer a .7 mm Uniball Vision (fine, in pink, blue or purple). And for my signature, I always use a Pentel Signature Pen: Bold and Blue. I can attest to the therapeutic benefits of journaling. It causes me to focus my thoughts and drill down to the most important ideas, feelings, and concerns. I enjoy written conversation with myself, posing questions and providing thoughtful answers. What emerged was a dialog of apology, accusation, and an intense exchange that ended in forgiveness and a written promise to myself that I have never broken. Sometimes I’ve considered breaking it, but I never have. I always remember the written promise, serious proof of my commitment to myself. If there are things you need to tell yourself–promises, apologies, or thank you’s–consider putting it in writing and see if it makes a difference. Better yet, mail yourself a handwritten letter. When’s the last time you received one of those?! ?